I came to stay with my foster mama at the beginning of December. Both of us were pretty sure that I would have my very own family by Christmas. I was little, I was cute, I was sweet and I loved to cuddle. Plus who wouldn’t want a brand new puppy that already knew how to do all of her business outside? I would have been happy with a new mama or a new dad. I would have been happy with kids or without. I would have really liked to have a 4 legged sibling since I love to play and wrestle so much but I would have been just as content in a home with a lot of toys to keep me busy and entertained. I like my foster mama, my foster siblings and my foster home all just fine, don’t get me wrong, but I just would rather have a forever family to call my own. I was looking for my own people to love and to kiss, my own yard to run in and explore, my own bed to curl up in at night. While it looks like I won’t get my own family in time for Christmas, I’m still hoping that my family will find me by the New Year or not long after that. If you’re looking for a dog that bounces when she runs, a dog that gives the best little puppy kisses, a dog with two floppy ears, a playful and energetic little girl check out my profile, I just might be the dog for you. And I’ll be waiting. 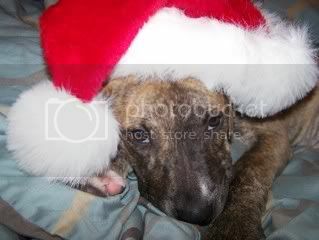 Posted in Foster Updates, In the News on December 30, 2008 by Michelle. Aww Emme, keep hope alive, they are out there, they are just waiting to find you!